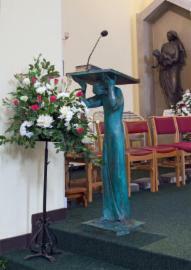 Helping - Welcome to St Lawrences Church in Feltham, Middlesex. Our comprehensive parish programme of sacramental preparation is only possible through the hard work of our devoted team of catechists. They work behind the scenes at our preparation classes, assist with the Liturgy for Children at Sunday Masses and help at our Sunday School for children in non-Catholic schools. Over 300 people of all ages take part in these programmes every year and more helpers are needed for this extremely rewarding work. Training and support are offered to all new volunteers.